released total 47 vacancies on permanent basis. Interested/ Eligible candidates fulfilling all eligible criteria mentioned in the notification may visit the official website UKSSSC www.sssc.uk.gov.in. Select the desired post and apply through online only. UKSSSC Fire Fighting Officer Application link activates from 15-November-2017 and closed on 30-December-2017. Application fee for SC/ ST/ PWD candidates is Rs. 150/- and for UR/ OBC candidates is Rs. 300/-. Application fee payment will be closed on 30-December-2017. Age of the candidate for this UKSSSC recruitment is 21 years to 28 years. 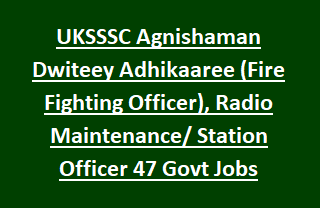 Find the below given details regarding Selection Procedure, Application Procedure, Age limits, Application Fee, Educational Qualifications, Notification Dates of UKSSSC Uttarakhand Subordinate service Selection Commission Recruitment of 47 Agnishaman Dwiteey Adhikaaree, Radio Maintenance Officer, Radio Station Officer are stated below. Available vacancies in Uttarakhand Subordinate Service Selection Commission Recruitment are 47 posts. Total no of vacancies: 47 posts. 1. Agnishaman Dwiteey Adhikaaree (Fire Fighting Officer-Only Male): 19 posts. 2. Radio Maintenance Officer: 11 posts. 3. Radio Station Officer: 17 posts. Agnishaman Dwiteey Adhikaaree: Degree with Science subjects (Physics, Chemistry and Mathematics) and Diploma in Computer Applications. Radio Maintenance Officer, Radio Station Officer: BSc with Physics & Mathematics. Age of the candidate for all UKSSSC Vacancies is 21 years to 28 years. Age Relaxations admissible as per Uttarakhand Govt instructions. Application fee for SC/ ST/ PH candidates of Uttarakhand state is Rs. 150/- and for UR/ OBC candidates of Uttarakhand is Rs. 300/-. For application fee Procedure details see the notification. Uttarakhand UKSSSC recruitment selection is based on candidate merit skills in written examination. Chest: 78.80 cms to 83.80 cms (General/ OBC) and for all other candidates is 76.50 to 81.50 cms. Candidates who have qualified physical standard, Physical fitness test will be called for written exam. Written examination will be held for 100 marks consists of objective multiple choice questions on Physics & Mathematics. Interested/ Eligible applicants have to visit UKSSSC official web link www.sssc.uk.gov.in. Before applying go through the application filling instructions. Select the post and upload the filling application with supporting documents from 15-November-2017 to 30-December-2017.